When is a bench so much more than a bench? When does a bench have the power to connect people of all ages and experiences and create a community of upstanders? 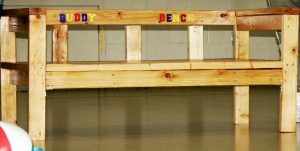 When it is a Buddy Bench built by at-risk youth from Rushford Academy in Durham. Thanks to 34 individual donors and the countless contributors to two Funds at the Community Foundation of Middlesex County, the residential teen students are learning positive life skills and giving back to their community. The students at Rushford Academy are building wooden benches for local schools to use as a social inclusion tool. The benches are clearly labeled “Buddy Bench” and strategies for use are provided to school staff and students with each installation. The initial idea for the bench building project came from a Rushford Academy resident supervisor’s desire to engage the young men recovering from substance abuse. He was looking for an interactive activity that would foster teamwork, commitment, and useable skills. 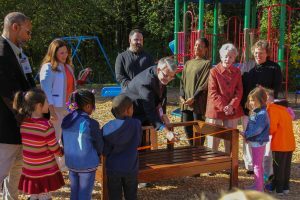 The “Buddy Bench” project was the perfect opportunity – adding purpose and a community service benefit to the young men’s efforts and providing a conduit for grade school children to “buddy up” with those who may be feeling isolated during recess or other free play activity times. All that was missing was the money to cover the cost of materials. Through a grant application to CFMC’s At-Risk Boys Fund, the project came to the attention of the Community Foundation. CFMC’s Council of Business Partners Fund, a group of local business owners supporting positive youth development programs throughout the year, immediately agreed that the project met both Funds’ missions, and the residential teens at Rushford Academy received a grant to produce the first four buddy benches. With one bench in production, the project took on new life and funding expanded to include benches for all elementary schools attending last year’s Rally For Bully-Free Communities, an annual event organized by the CFMC Council of Business Partners.